When creating a culture of continuous improvement, one of the most common ways to encourage improvement is to think about ways to make the five-foot radius better. This could be a small Just Do It or an Opportunity for Improvement. There is one other type of important - but often overlooked - aspect of improvement work for reviewing previously completed projects, such as large construction builds, inter-office collaborations, or even extended medical studies. It can go by many names, but the most common titles are Debrief or Plus/Delta. Debriefs are not the traditional improvement templates such as the previously mentioned Just Do It or A3s. Debriefs are a planned measure, aiming to look back on previously completed work. As shown above, it can be a relatively simple template with three fields. The Plus - Good field is meant for successes of the project. What went well? What was done different than usual that was a success? What was done that should be implemented in the standard work documents for future projects? This field is a great way to look back on projects and process all of the ways that standard work is important to the projects that are done. Highlighting the successes of projects are just as important as figuring out where processes were not optimized. Highlighting the successes is important for a number of reasons. When successes are called out, you validate the effort of the staff members involved. This increases their engagement and makes them more likely to participate in future projects. While the Plus - Good field is a way to measure the successes, the Delta - Improve field is a way to capture processes that might need a bit of work, or that might even need a complete overhaul. This can refer to standard processes that may have faltered or actions taken for the first time that need to be checked or reviewed. When standard processes falter, they need to be updated and corrected to make sure that those issues no longer occur in the future. If staff members all use a flawed standard work method, then there is an increased risk of defects in future work. In addition, adhering to standard work is important to keep work consistent at every step of the project. Keeping in line with the outlined steps is key in reducing defects. This last field is where you can make notes about what needs to be done in the future. You can then transfer these to make their own projects or improvements and assign them out to whoever is best fit to solve the issues and work them. Listing them out in a notes section can help organize thoughts before converting them into improvement work. 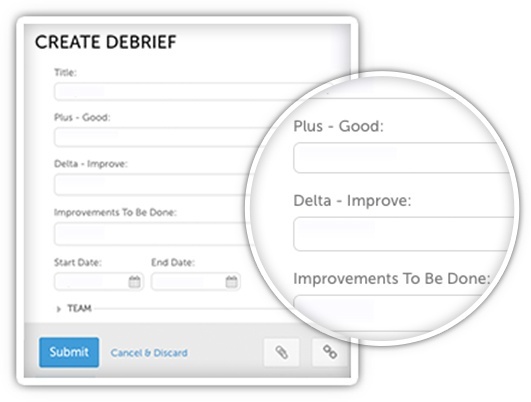 The Debrief is a great tool that is often underutilized. Bringing a method of review to bigger scale projects can help make future projects more efficient. Using continuous improvement software to track the reviews gives the entire organization access to them and allows team members anywhere in the world to update their standard work and keep up with the rest of the organization. Using paper Debriefs can mean that important information learned from these projects cannot be easily shared. That means less collaboration among team members, a break in standardization among departments and it becomes more difficult to track the impact that was found as a result of the Debriefs. Using continuous improvement software to bring your Debriefs to the cloud is the best way to get the biggest impact out of your Debriefs and share to make your future projects even better.